This is my first venture into no-bake, i.e. 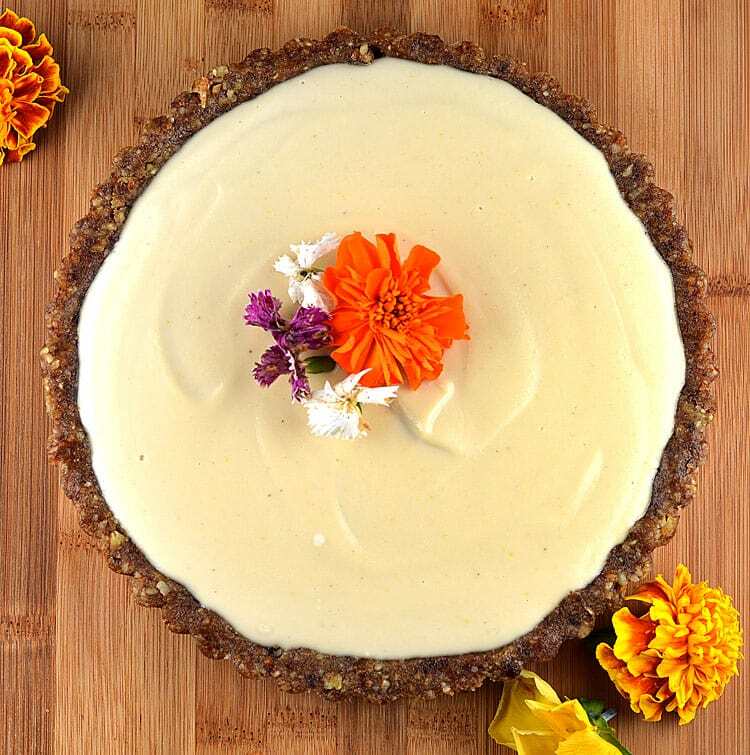 (raw) vegan desserts and this Lemon Cashew Cream Tart was an absolute delight! If you are sensitive to, or have any type of nut allergies, I’m sorry to say that this is not the dessert for you. The “crust” is made from walnuts and dates. The “cream” is made from soaked cashews, lemon juice, lemon zest, agave syrup and a pinch of sea salt. We placed it in the freezer for an hour or so just to firm up enough to slice. It is reminiscent of key lime pie! It’s simple enough to be able to taste all of the flavors individually. Tart from the lemon and sweet from the agave. It is both rich in flavor and creamy in texture. I know that nuts are not inexpensive and given how rich this dessert is, you need only a small slice to feel satisfied. This is an 8″ tart pan from which created 8-10 portions. I found the pan on Amazon.com and it comes in various sizes. The first step is to create the crust and to do that, we placed dates into boiling water for 5 minutes to soften. We then took walnuts and ground them in a food processor. Drain the dates and add to the nuts. You can also add organic vanilla and a pinch of sea salt at this point. This really brings out the flavors. Press into desired pan as shown. Chill the crust while you prepare the filling. If you are at all familiar with cashew cream, you know that cashews need to be soaked. Two hours minimum if using a high speed blender, overnight is even better and especially if you are using anything other than a Vitamix or Blendtec blender. The cashews become plump and soft. Drain the water and place into a blender along with the juice (and zest) of 1 large lemon, a pinch of sea salt and agave nectar. How sweet you make it is up to you. I ended up adding a bit more after it was blended and needed the juice of another lemon – mine were just not producing much. Keep in mind that the dates in the crust also contribute to the overall sweetness of this dessert. 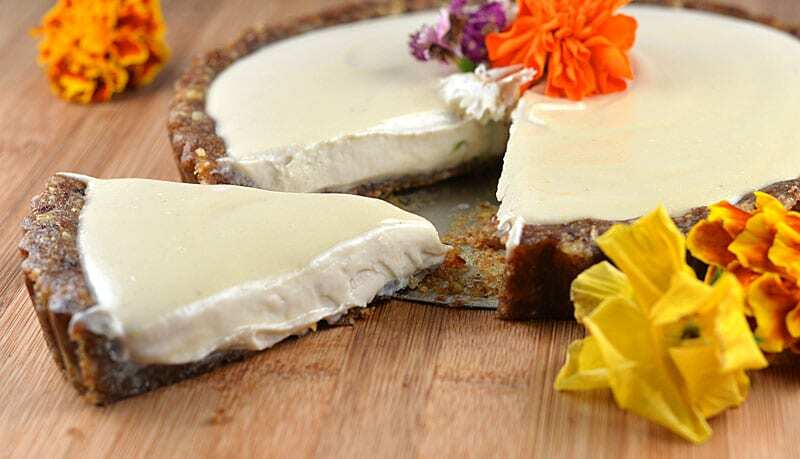 After blending and getting the lemon and agave just right, remove the crust from the freezer and pour the cashew cream into it. We had about 3/4 C of cashew cream left over (since we were using a smaller than average tart pan). Use this as you would whipped topping, such as spooning it over fresh berries. Return the tart to the freezer for 1-2 hours or until firm enough to slice, but not completely frozen. Slice into wedges. 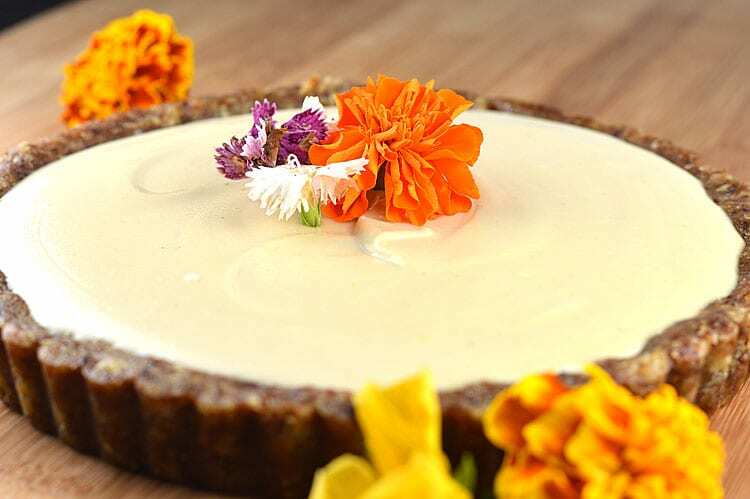 You can garnish with edible flowers as we have here, or even fresh fruit. Kiwi and blueberries come to mind. Below you can see the texture. This is almost like soft-serve ice cream. Solid, but creamy. You can, of course, freeze it a bit longer and it’ll be more like an ice cream. I sometimes feel that if a dessert is too cold, it takes away from the flavor and thus prefer mine just a bit thawed. Add walnuts to a food processor and chop until coarse crumbs form. Drain the soaked dates and add to the nuts. Add vanilla, pinch of salt and hot water. Pulse to combine. It should hold together at this point. If not, add a bit more water. Press the mixture into a tart pan with a removable bottom and be sure to go up the sides as shown. Freeze until ready to assemble. Drain the soaked cashews and add to a high speed blender. Add water, lemon juice, lemon zest, pinch of salt and agave. Taste and adjust lemon and/or agave as needed. Add the cream to the crust and freeze for 1-2 hours or until firm enough to slice. Keep any leftovers frozen until ready to serve.